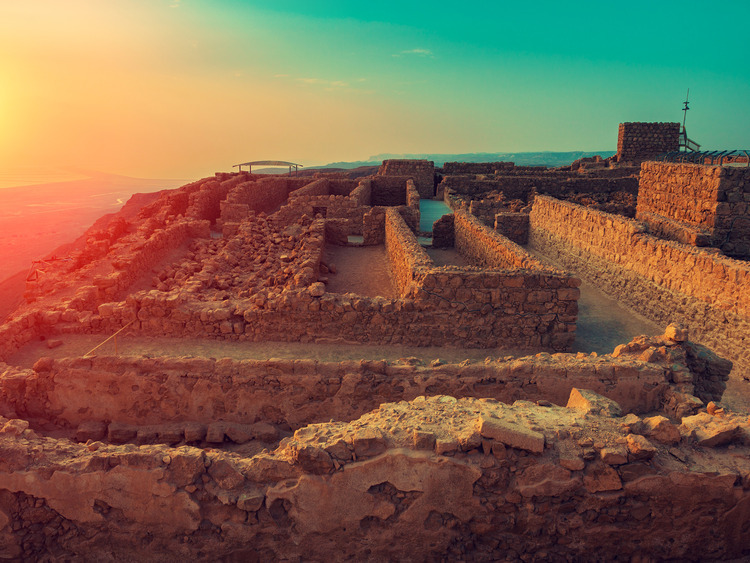 A visit to the imposing fortress of Masada and the benefits of the waters of the Dead Sea: a journey in search of culture and relaxation in a charming location. We will depart from the port of Eilath heading to Masada, the fortress which is sadly known for the siege of the Roman army during the First Jewish War and for its tragic end in 73 A.C.
After a brief journey by cable car, we will reach the top of the mountain where we can see, right before our eyes, a view of the incomparable beauty of the surrounding rocky desert and the Dead Sea. Our guide will accompany us through the ruins of the ancient fortress built by Herod the Great in 42 BC as a potential refuge in the event of a Jewish revolt or unrest incited by Mark Antony and Cleopatra. After the fall of Jerusalem in 73 BC, over 960 Jews, some of them soldiers, women and children, barricaded themselves inside the fortress to protect themselves from attack by Roman soldiers. The scene that the Roman soldiers were faced with when they finally reached the fortress and overtook it by force was horrific and devastating. The Jews had chosen mass suicide over slavery. Upon completion of this fascinating visit, we will leave the fortress and head in the direction of the Dead Sea, a salt water lake which was formed 2 million years ago in a valley about 400 metres below sea level. When we arrive, we will be welcomed into a modern, comfortable hotel where we can relax and delight our palates with a delicious, fresh buffet. After lunch, we will have some free time to relax and enjoy the benefits of salted water from the lake and even to experience the incredible feeling of freely floating on the water. The coach transfer from Eilat to Massada Fortress takes approximately 3 hours. We recommend wearing comfortable shoes and light clothing. Please take suitable footwear to wear when going in and out of the sea as some areas can be a little rocky. Bath towels are provided at the hotel. The high temperature and high concentration of salt of the Dead Sea waters may cause swimwear to discolour. This excursion is not recommended for pregnant women, guests with low blood pressure or heart problems. Bathing in the waters of the Dead Sea is not recommended for those under the age of 7 years. We do not recommend bringing valuable objects into the Dead Sea resort as lockers are not always available.